As a new pet owner, I’m more than attentive to the everyday needs of my pup. Food and water? Check. Regular bathroom breaks? Check. A weekly bath? Check. Lots of love on a daily basis? Check, check. Those are the easy ones. Where I’m more than a bit naive is the hidden danger department. Not talking about “dognappers,” open gates, or even that scary mailman. I’m referring to household items lying around your kitchen cupboards, closets, bathrooms, back yards and garages. 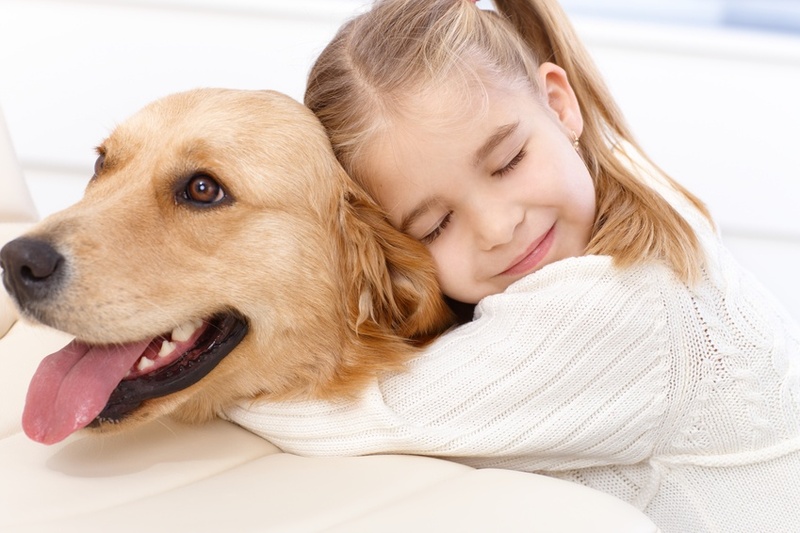 Poisons, toxins, whatever you want to call them, they are bad news for dogs, cats, birds and other pets. While some may seem obvious, like chocolate or medications, others are quite unassuming. Grapes and raisins? Who knew? Family Health & Wellness Magazine asked two local pet experts to offer up their top 12 home and garden items to keep out of reach of your precious pet. According to Dr. Robert Mansfield, D.V.M. of Granite Veterinary Clinic, ingested antidepressants like Prozac can cause hyperactivity, seizures and hyperthermia. Sleep aids like Valium can lead to central nervous system depression or stimulation. As a rule, keep all medications entirely out of reach from your pet, in a medicine cabinet or secure drawer or cupboard, and always make sure the caps are on nice and tight after use. All amphetamines are extremely harmful to pets and can cause central nervous stimulation, agitation, tremors and seizures. Even common anti-inflammatory drugs like Advil, Aleve or Motrin can lead to acute nausea, vomiting, hemorrhagic diarrhea and abdominal pain for pets. 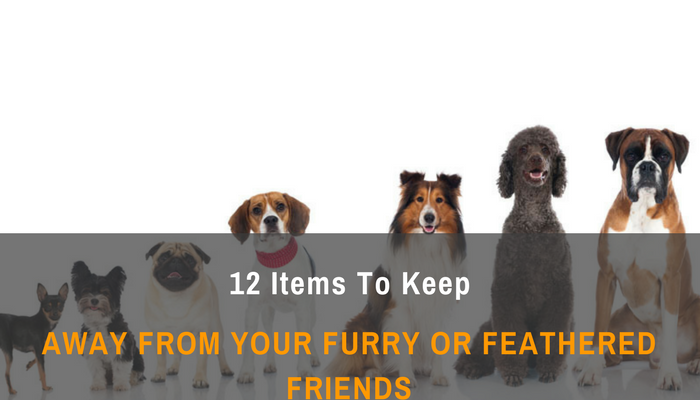 Keep purses and other bags that might contain pill cases away from both dogs and cats. If they can get their noses in there, they can also access its contents. Get smart before they get curious. This sweetener is found in many diabetic snacks, foods, baked foods and chewing gums and candies. If your dog or cat has a sweet tooth, it’s best to avoid having these items in their reach. Dr. Mansfield notes ingestion can result in profound, sudden hypoglycemia from insulin stimulation and higher doses are associated with acute liver damage. Also known as Teflon, this surface is commonly found on non-stick pans and cookware. Bird owners beware…when heated, this coating can release toxins into the air that can result in respiratory signs or sudden death of pet birds. Most die rapidly, with a quick progression from difficulty breathing to death. Keep the canary or other feathered friend out of harm’s way, especially in the kitchen. A more common risk to dogs with their chewing habits, these easy-to-find products pose big problems if punctured. Alkaline or acidic material can leak out, resulting in severe ulceration to exposed tissues. Dr. Mansfield points out that newer types of “disc-shaped” batteries can allow an electric current to pass to the tissues of the gastrointestinal tract as the battery is passed. This can cause a current-induced necrosis, resulting in tissue damage or even perforation of the oropharynx, esophagus, stomach or small intestine. Though not a toxin, these products made of compressed sawdust and wax pose a threat of foreign body obstruction. Those materials do not break down in the stomach and can result in gastric or intestinal obstruction. Most pet owners have heard about the dangers of this otherwise delicious product, but why so toxic? Dr. Mansfield shares that it’s the most common intoxication seen, with clinical signs that include central nervous system stimulation (restlessness, hyperactivity, muscle twitching, seizures), hyperthermia, vomiting and diarrhea. Yep, bad too. The sweet fruit, dried or not, can lead to kidney failure in dogs and potentially some cats. Not only do they deter first dates and vampires, but these pungent ingredients can also lead to lethargy, weakness and pale mucous membranes due to red blood cell destruction when ingested. Hold the onions, please. Found in just about anything you can imagine stored in the garage, such as kerosene, engine oil, tiki-torch fuels, gasoline, diesel fuels, paint solvents, wood stains, wood strippers, liquid lighter fluids and asphalt/roofing tar, these gastrointestinal irritants harm the respiratory system if inhaled, as well as eyes and skin if touched. This nasty stuff actually tastes sweet to some cats, according to Dr. Carolyn Standen, D.V.M. of The Cat Clinic in Folsom. Ingestion can cause inebriation, nausea and vomiting with likely irreversible kidney failure. Make sure caps are on tight and as far out of reach as possible, preferably behind a secured door. Problem with mice, gophers or rats? Make sure that solving that issue doesn’t create a new one for your dog or cat. If a pet ingests an anticoagulant rodenticide, bleeding can be expected, and presenting complaints may include lethargy, loss of appetite, coughing up blood and lameness. For bromethalin rodenticides, clinical signs include muscle tremors, hyperthermia, extreme hyperexcitability and focal or generalized seizures. For the cholecalciferol rodenticides, signs are related to the secondary hypercalcemia, and include increased drinking and urinating, lethargy, inappetance and vomiting. Snail bait is also a big “no-no” for cats. Look for other, safer options for ridding your property of unwanted vermin and pests.